Quick Flip! Not bad for a couple of hours of work, huh? Looks great! White is so classic and looks great on anything!
. . . hard work!!! Looks great!!! So glad you sold it:) It looks fantastic! What a great find, it looks great! Stunning! Did you have to sand it before you applied the primer? Thanks everyone for the sweet comments! @ the Hungry Culinary Student, yes I did sand it slightly (mostly on any rough areas) and then primed it. Take Care! goodness Carli, how did i miss this? you did a beautiful job. 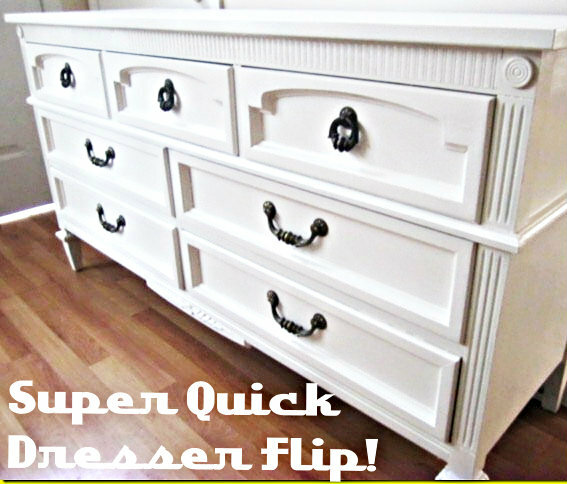 the hardware looks amazing with the dresser painted white. congratulations on your sale!! !